The Public Test Shard (“PTS”) is a shard on a separate PTS Client that is accessible by everyone and is updated on a regular basis with new content and changes prior to them making it to Live. This allows the players to test things out and hopefully find bugs and glitches or provide feedback prior to the content making it to Live. As well as helping to assist Trion provide a slightly better version of content prior to their release on the Live clients, players themselves can benefit from the PTS through early information. This allows the players to go through quests prior to Live, allowing for a better chance at shard firsts. Or – as mentioned in my guide on making platinum – it can help provide you with information on market changes prior to new content being released. Accessing the PTS Client + Dummy Foundry – You can find instructions on downloading and accessing the client through our guide, which also includes information on the two Dummy Foundry instances where you go to buy test gear/item packs. Came out on: Dec 9th 2015. Full RIFT 3.5: Winter’s Wrath Patch Notes + additional useful information can be found here. (this list does not include soul changes mentioned above or temporary events). No known content on Live removed on PTS. Gifting Bag Slots to other players. Currently no ETA although Daglar has confirmed he would like to add this feature. More Emotes, More Dances – Looking to add more emotes and more dance animations. Have a suggestion? Check out Marigold’s thread here. Looks like /lookout might be a new emote viewable on Live with High Elves/Kelari. Ambient Dimension Sounds Toggle On/Off. New Possible Dimension Keys. Current keys slated are: Solstice Tower, Luminous Passage, Cathedral of Canus, Ghar Station Mem, Ghar Station Tau, Temple of Ranri, Port Scuddra and Temple of Aia. More info here. Might be postponed, and no guarantees. New Dimension Blocks. Morticus showed off what looks like a translucent/transparent building block and two other unknown blocks that the art team are working on. [Image] [Thread]. A lot of generic class-related info here was mentioned during Rift’s Reddit AMA in Oct.
Vouchers to the Cash Shop. ‘Show additional overhead NPC icons’ by default. Chat Restriction Adjustments. Looking at potentially getting rid of the ‘sent too much mail’ and ‘sent too many chat messages’ restrictions for raids, groups and guild chat/transactions. On-going improvements set over multiple patches. One of the recent ones was to guild memory. Snedhepl has a write-up about it here. Gliders. Talked about internally and on Daglar’s wishlist but unknown when or if it will actually arrive. Monty and Rodney Combat Pets. Warrior Beastmaster and Rogue Rangers were supposed to get new combat pets named Monty and Rodney respectively. No ETA was given. 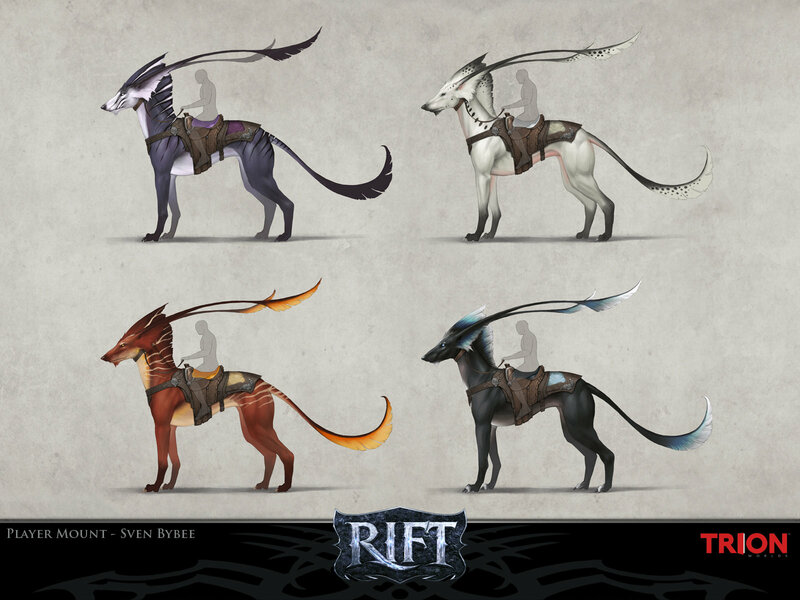 [r] However, these might be scrapped as the Primalist’s Griffon avatar uses one of the combat pet’s models. Minion Stamina Potions. Datamined from Live client. Potions that probably replenish Minion Stamina. [r] These may have been abandoned with the introduction of the Minion Stamina Recharge button on Live. ‘Temporal Alchemist’. No info on it, but it was teased at in passing in a Livestream. [Been almost two years since the livestream so it might have been a teaser for something that already exists in the game]. Cross-shard AH. Too difficult to implement. [Update: 13th June 2014] Daglar mentioned on the 13th June 2014 Livestream that he wants to do Cross-shard AH but that the new Auction House UI and improved functionality would be a priority. (We’re going to keep Cross-Shard AH under “currently off the table” until more solid information is presented). Cross-shard Trading. Not possible due to server architecture (and duping concerns). 3-Day Patron Pass. Not happening. [r] Note: Trion has given away 3-day patron several times over promo weekends. However, it looks like the 3-day Patron Pass itself will probably not be for sale anymore. Tier 6 or higher item limit. Trion has stated that they cannot go past 2,520 item limit. Salvaging dimension items. Won’t do it due to economic issues. Dying Dimension Items. No plans to allow dying (color) of dimension items. Combat NPCs. Combat NPCs that fight back can’t work out due to pathing and other issues. World PvP. No new improvements to world pvp or any world pvp quests. Arenas. No Arenas. Daglar has made that clear multiple times. Making Seastone (NA) Guild vs Guild. No to Seastone GvG. Changing CQ Queue System. No to changing the CQ Queue System. There is also changes on the Riftblade spec which aren’t noted here ! Thanks and well done for all that information Riftgrate gave us btw ! Really good work !